Everyone has a thing they hate about driving in Spokane. Maybe it's the 5:15 pm eastbound I-90 traffic jam. Maybe it's the detours on your way to other detours. Maybe it's the potholes so deep that, when you gaze into them, they gaze back into you. Maybe it's Inlander journalists slowing down the path of your giant red pickup truck by biking on a street with a common bicycle. For me, it's the infamous Maple Street Bridge merge. It goes like this: Driving westbound on Riverside, you hook a right on the ramp to head north across the Maple Street Bridge. But as you drive down the ramp there's a big concrete barrier in the way, blocking your view of the traffic coming from your left. If you're unlucky enough to hit it during rush hour, you'll often end up coming to a full and complete stop at the point of merging. As the cars whoosh past you on your left, and the cars pile up behind you, you've got to crook your neck around, out your window, and find the right moment to speed between the gaps in the traffic, merging from zero miles an hour to traffic speed. Last Monday, I called Julie Happy, division communication manager for the Department of Business and Developer Services to see if anything could be done to fix the most irritating merge in Spokane. 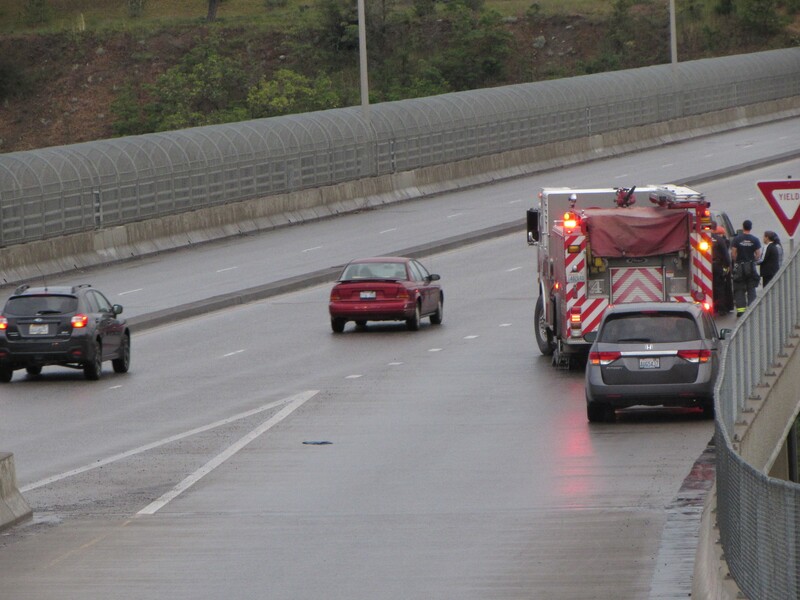 In 2015, there were six accidents on the bridge's ramp alone, all rear-end collisions. So can it be improved? Probably not. "The ramp is an extension of the bridge and has design standards which have to be met. One of those is a crash-certified barrier for traffic which the existing concrete barrier meets," Happy wrote in an e-mail. "These barriers have a certain height and shape to meet standards. They cannot be cut down and still meet standards." While Happy notes that the merge point "still allows plenty of room for merging safely onto the bridge," she does cites a possible reason for growing frustration for motorists. "We are seeing more traffic on the bridge, which is creating less gaps in the traffic to allow this merge onto the bridge for north-bound Maple," she writes. I'm not traffic engineer, but I have a few off-the-cuff ideas on how to improve this intersection. 1) Giant mirrors above both lanes of traffic to spot where other drivers are driving. 2) Kindly old-fashioned constable with a handlebar mustache who directs traffic—when to merge, when it's safe. 3) City-subsidized arcade tokens to improve merging ability by giving drivers practice on Frogger. 4) Detour signs that route all traffic to the Monroe Street Bridge. 5) The introduction of "tolling stations" to introduce more gaps in traffic, and pay for giant mirrors, constables, detour signs, and arcade tokens.